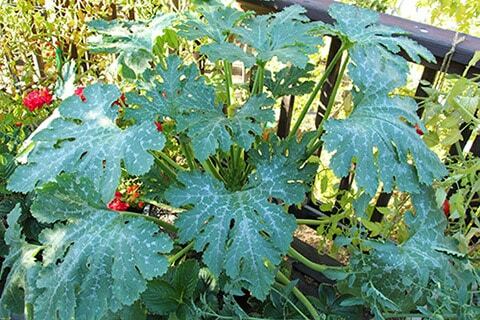 We’re trying a new zucchini seed this year developed especially for container growing, and the plants are great — giant decorative foliage with abundant zucchini tucked into the center of the bush. 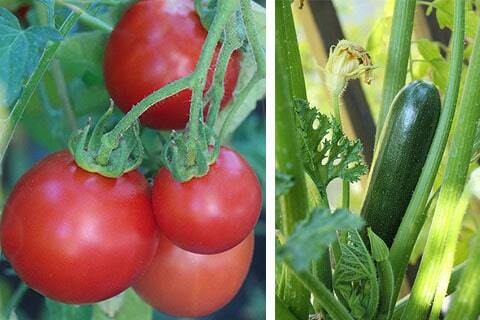 The variety is called Astia and is sold by Renee’s Garden seeds. If you need to grow your veggies in pots, this is a nice way to do zucchini. Happy 6th Anniversary to SSS! Thanks, Cynthia! My pics don’t do justice to the zucchini leaves. They’re really pretty! I really dislike when it’s that hot. Only extreme cold (we never have it like that here) is worse. Home grown tomatoes are the best! This type of heat wave is too warm even for heat-loving me. The poor plants are swooning in the afternoon and we’re trying to keep some water on them to revive them. It’s supposed to gradually cool this week though. Because I know you’re just dying to know, my mystery squash looks like it is an acorn squash. The tomatoes are so red, it looks very delicious.